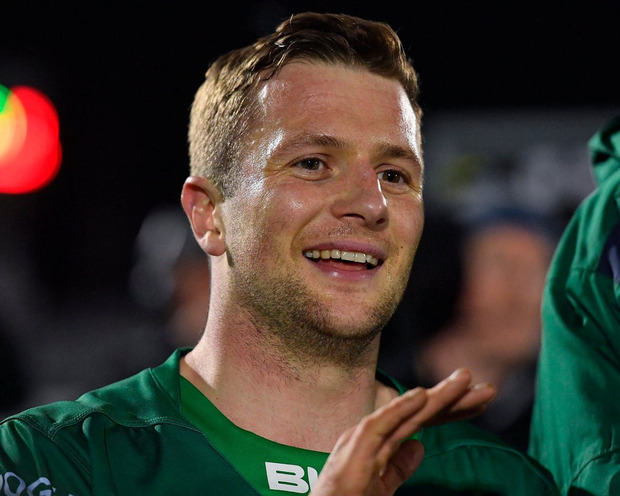 The 26-year-old couldn't have scripted it better as he came off the bench to edge Connacht back in front after they had surrendered a 14-0 lead and then he set up the clinching try for Matt Healy. 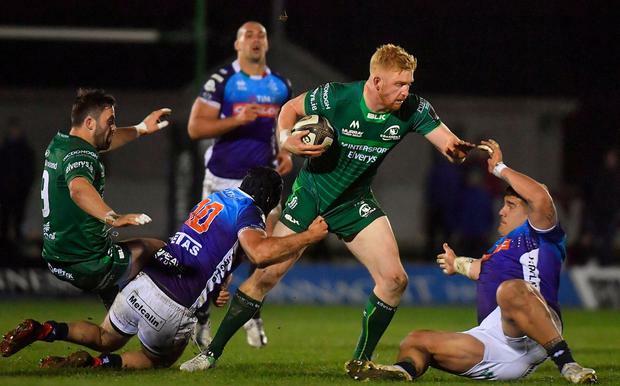 But Carty's eye-catching cameo didn't end there as he crowned the win by getting the bonus point in the final play with a converted try that saw him surpass Ian Keatley as Connacht's all-time top scorer. 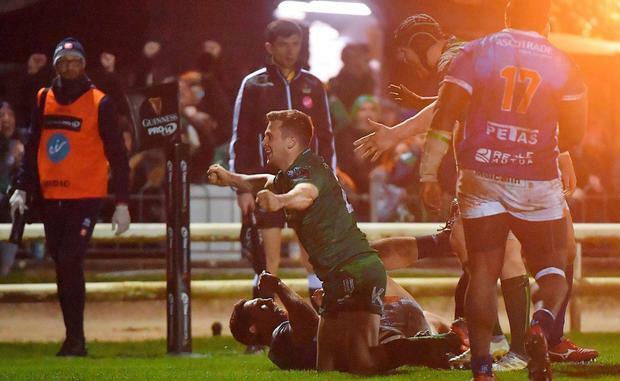 Benetton came to the Sportsground boosted by their longest unbeaten run in the competition and knew that pushing that out to nine games without a loss would give a huge boost to their hopes of making the PRO14 knockout stages for the first time. And the confidence gleaned from that excellent run of form was apparent early on as they took the game to Connacht. However, while they enjoyed 76pc of possession they found themselves 7-0 down towards the end of the opening quarter. Scrum-half Caolin Blade, fresh from his first involvement in an Irish squad, spotted the lack of pillars in the Benetton defence and darted from a ruck just outside the 22 to sidestep Ian McKinley and dive over between the posts. Connacht took control from there and doubled their lead on the half-hour. Initially Benetton did enough to repel them and looked set to survive when Tiernan O'Halloran was stopped short, but James Cannon did enough to force Duvenage to spill the ball behind his own line and Healy pounced to touch down, with Godwin converting for 14-0. But Benetton hit back before the break, opting for a scrum in front of the posts after a 12-phase move had coughed up with their sixth penalty of a half where they conceded just one penalty. It was a smart move as No 8 Toa Halafihi broke from the base and put replacement out-half Antonio Rizza, who had come on for the injured McKinley moments earlier, over for a try which he converted himself to cut the gap to 14-7. 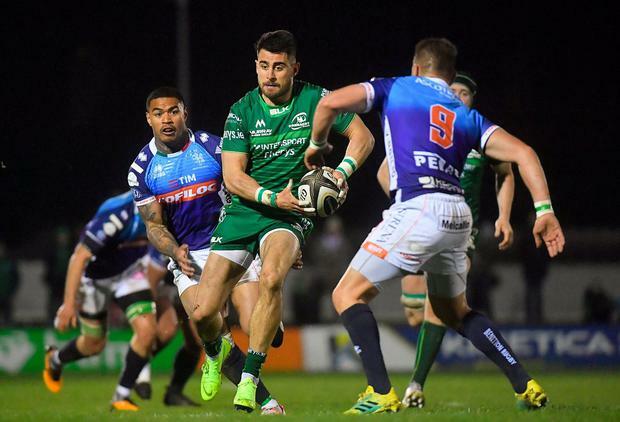 Benetton hit back to level after 55 minutes through Duvenage but the arrival of Carty turned the game back in Connacht's favour and the home side secured a valuable win. Connacht - T O'Halloran (S Fitzgerald 38, HIA); D Leader, T Farrell, P Robb, M Healy; K Godwin (J Carty 57), C Blade (K Marmion 57); D Buckley (P McCabe 60), S Delahunt (T McCartney 52), F Bealham (C Carey 62); U Dillane, J Cannon (G Thornbury 57); E McKeon, C Fainga'a, J Butler (E Masterson 71). Benetton Rugby - L Sperandio; R Tavuyara, T Benvenuti (T Iannone 65), A Sgarbi, M Ioane; I McKinley (A Rizzi 31), D Duvenage; N Quaglio (D Appiah 51), H Faiva (T Baravalle 31), M Riccioni (T Pasquali 67); I Herbst (R Barbieri 68), A Zanni (M Barbini 51); M Lazzaroni, G Pettinelli, T Halafihi.